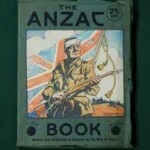 April 25 marks one of Australia’s most important national days, Anzac Day. Last year, we looked at the phrase ‘One Day of the Year’. This year, we take a look at a number of terms that were first used during the Gallipoli campaign by the soldiers who served there in the First World War. Australian and New Zealand troops were sent to fight in the Dardanelles, alongside the British and French forces. The term Anzac quickly came to designate the Australian and New Zealand soldiers, deriving from Australian and New Zealand Army Corps. The term Anzac also came to be the name of the place where the Allied troops landed and fought the Turkish forces, as this quotation from the diary of Australian soldier Percy Smythe suggests: ‘Another rumour says we are to land at the place called Anzac, from the initials of Australian and New Zealand Army Corps.’ (August 26, 1915) From Gallipoli onwards, the Australian soldiers were known as Anzacs. Percy Smythe wrote in his diary in 1916: ‘Viv [his brother] got another letter from Mum. They had read about the Anzacs at Pozières, but had no idea of our whereabouts. Mum apparently thinks the word “Anzac” refers only to those who were at Anzac.’ (October 9). 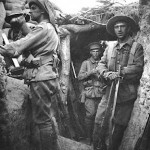 One of the words first used in the context of Gallipoli and which subsequently became a common term in Australian English is possie. This abbreviation of ‘position’ was used in relation to getting a good position against the enemy. Few people perhaps now realize that this term had its origins on the beaches and trenches of Gallipoli. Another term that would continue to have currency in Australian English and which appears to first come into currency in 1915 in the context of Gallipoli is dinkum oil. The term had two senses: one was ‘accurate information’ and the other was ‘false information; a rumour’. The first printed evidence to appear in newspaper records for the ‘accurate’ sense of this term is from 1915. Corporal George A. Leyshon, a young soldier from Victoria who would soon die from his wounds at Gallipoli, wrote home to his mother on April 12. He recounted General Sir Ian Hamilton inspecting the troops and telling Leyshon’s CO that they would soon head off into combat: Leyshon wrote that Hamilton gave the Colonel ‘what we slangly call the ‘dinkum oil’’ (Melbourne Argus May 19, 1915). Several terms referring to rumours or false information developed through the first period of the war—and probably dated to just before the Gallipoli campaign—including furphy, derived from the Furphy water carts which delivered water to the Broadmeadows camp where soldiers trained before heading overseas. A similar term for a rumour which appears at Gallipoli but which was relatively short-lived was beachogram. All of these terms reflected the importance of getting accurate information about the war and what was likely to happen—something that often proved difficult. The First World War was a productive period in the development of Australian English, as these words from Gallipoli attest. This entry was posted in slang, war and tagged Abdul, Annie from Asia, Anzac, Asiatic Annie, beachogram, Beachy Bill, CEW Bean, dinkum oil, furphy, Gallipoli, Jacko, Johnny Turk, possie, The Anzac Book by Amanda Laugesen. Bookmark the permalink.